One of three schoolgirls who left the UK to live in ISIL’s so-called “caliphate” has said she wants to “come home” as she is nine months pregnant. In an interview with The Times newspaper, heavily pregnant Shamima Begum, now 19, said she was tired of life on a battlefield and feared for her unborn child after two of her other children died. 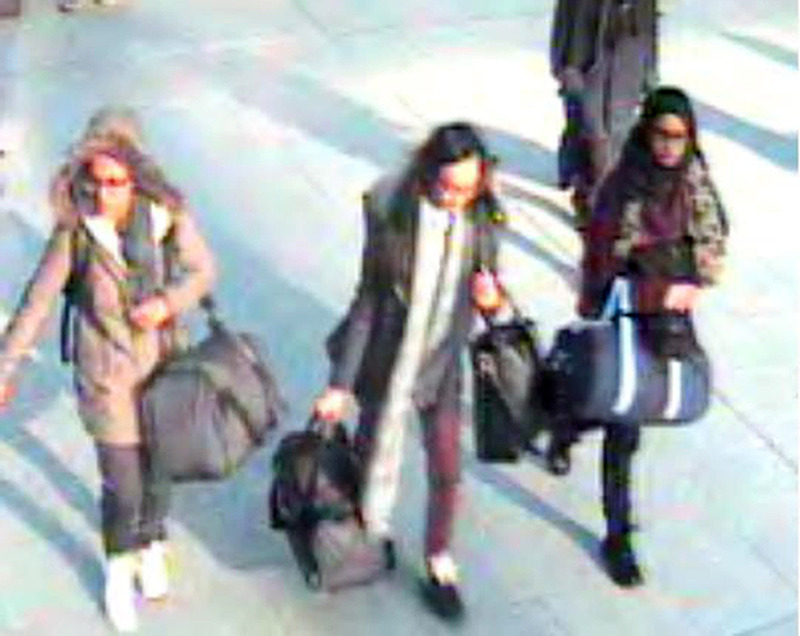 Begum left London for Syria with two of her friends in February 2015 after ISIL, also known as ISIS, launched its blitzkrieg across large parts of Syria and Iraq, capturing territory the size of the UK. After arriving in Raqqa, the de facto capital of ISIL, the three girls were placed in a home for ‘single women’ before Begum was married to Dutch fighter Yago Riedijk, 12 years her senior. “I’m not the same silly little 15-year-old schoolgirl who ran away from Bethnal Green four years ago,” Begum said, speaking from the al-Hawl refugee camp in north-east Syria. Syrian forces backed by the US took full control of Raqqa in October 2017, prompting its fighters to flee to other parts of Syria and across the border into neighbouring Iraq. Begum said that her two friends – Kadiza Sultana and Amira Abase had also married foreign ISIL fighters. Sultana was reported to have died in a 2016 air raid on Raqqa. Begum said that Abase, the other schoolgirl, may still be alive. Begum spoke fondly of her time under ISIL, saying she lived a relatively normal life despite seeing “beheaded heads” in bins and being forced to observe ISIL’s strict and literalist interpretation of Islam. “Mostly it was a normal life in Raqqa, every now and then bombing and stuff,” she said, before giving a conflicting account of the so-called caliphate. “There is so much oppression and corruption going on that I don’t really think they deserve victory”. However, she added: “I don’t regret coming here”. “I don’t have high hopes. They are just getting smaller and smaller,” she said. Begum said her family had moved down the Euphrates valley as ISIL retreated, eventually arriving in ISIL’s last remaining stronghold of Baghuz, a village in Deir Az Zor province. But after the deaths of her one-year-old daughter and three-month-old son in recent months she “fled the caliphate,” while her husband surrendered to a group of Syrian fighters allied to the Syrian Democratic Forces (SDF). “I was also frightened that the child I am about to give birth to would die like my other children if I stayed on so I fled the caliphate. “Now all I want to do is come home to Britain”. Begum’s sister, Reenu, pleaded for the British government to allow her to return, telling ITV News that she needed to be at home, “where she belongs”. “She’s pregnant and vulnerable, and it’s important we get her out of al-Hawl camp and home as soon as possible. The former head of Scotland Yard, Bernard Hogan-Howe, said in 2015 that Begum would not face terror charges if she returned – unless there was evidence she committed any specific crimes while with ISIL. “I am relieved that she is alive and simultaneously appalled by the news that someone so young has birthed and lost children,” Tasnime Akunjee, the lawyer representing Begum’s family told Sky News. He added that the topic of Begum’s return was “a contentious issue and stirs up very strong positions from the public”, adding: “There is a very traumatised young person who will have to live through the rest of her life with the added burden of the reporting of her tragedy”. The US-backed SDF believes that some 400 to 600 ISIL fighters are holed up in Baghouz, including many hardened foreigners who are expected to fight to the death. ISIL still retains a presence in Syria’s vast Badia desert and has claimed a series of deadly attacks by sleeper cells in SDF-held areas.